Emergency personnel converge on the scene of the accident. Rollover Accident on US-146, LIVINGSTON, May 2, 2010 - At approximately 8:20 am on May 2, 2010, a maroon 1990 Chevy truck driven by Georgie Drake, 74, of Daisetta was south-bound on US-146 (about 6 miles south of Livingston) when she allegedly fell asleep at the wheel. Drake's vehicle left the road to the left and took out a mailbox. She then over corrected to the right and rolled. Her vehicle rolled 2 times and came to rest on the left side of the road upside down facing south. Americare Ambulance Service was dispatched to the scene along with Polk County Sheriff's Deputy Terri Mayer and DPS Trooper, David Flowers. Georgie Drake was removed from her vehicle by emergency personnel and loaded onto an Ambulance and treated at the scene and then transported to Livingston Memorial Hospital with non-life-threatening injuries. Drake was later released. Traffic was not blocked during investigation and cleanup. Drake was issued citations for unsafe speed and driving with an invalid license. A rollback wrecker from Fawbush Body Shop recovered Drake's vehicle where it will be stored in Livingston. The scene was cleared by 9 am. Deputy Terri Mayer assisted Trooper David Flowers. 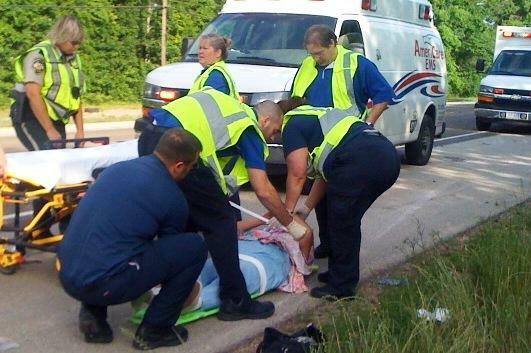 Georgie Drake was loaded onto an ambulance and taken to Livingston Memorial Hospital. DPS Trooper David Flowers (right) investigated the accident.